What eats polystyrene? Let’s find out! Polystyrene is everywhere: your daily serving of yoghurt comes in a polystyrene container, and those disposable knives and forks are made of it too. So is the foam packaging that surrounded your new computer, or that foam cup that holds your coffee. 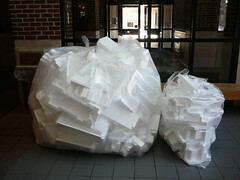 As useful as polystyrene is, it is also an environmental hazard. Although it is recyclable, much of it still ends up in landfills. It is highly resistant to photolysis (breakdown by sunlight), and at the moment, we’re not certain what microorganisms might feed on polystyrene to break it down. Thus, all that plastic we are dumping in the garbage may be around for hundreds, if not thousands of years. A team at the University of Leicester wants to change that. They’ve developed a project to investigate what microorganisms might be interested in nibbling on these plastics, and they need your help. All you need is a shovel and a calendar. After you buy a sampling kit from the team (for just £2.50), you’ll get a package in the mail that contains a strip of expanded polystyrene in a self-seal bag, an experiment protocol, a risk-assessment form and a stamped, addressed envelope for returning the samples. You’ll be asked to bury the strip in your back yard for a certain amount of time, and then dig it up and send it back for analysis. The team will then culture the bacteria growing on the sample, and attempt to identify the species. Participants whose strips harbour the most polystyrene-eaters will be invited to be authors on the paper reporting the team’s findings. The citizen science project is part of a larger effort that represents Leicester’s entry into the International Genetically Engineered Machine (iGEM) annual competition.